Mobiloitte News and Press Release. Mobiloitte-New-Logo Mobiloitte had been contemplating about Bangalore presence for a long time and the moment has arrived. We are finally here at Koramangala, Bangalore, closer to our many esteemed clients and friends. "We are really happy to announce the opening of our new office, said Jagdish Harsh, Group CEO of Mobiloitte.” This center is located in close proximity to some of the world’s leading high-tech companies. The location will also give us access to a rich pool of the finest talent in the region that we can use to fuel the continued growth in the fields of Blockchain, IoT, AI, and Machine Learning in addition to Mobile and Web technologies. We shall start hiring in Bangalore by mid-December, this year”, Harsh added. Hong Kong, China – To pave the way for an open and transparent Blockchain powered world, “Mobiloitte” a decade old name in Technologies had a remarkable presence at the multi-visual conference that was organized by Global Blockchain Cooperation Alliance (GBCA) on 15th and 16th August 2018 at Hong Kong. The conference was focused on analyzing the characteristics of Blockchain technology and put forward constructive opinions on the “Prospects of Blockchain Technology Development”. Jagdish Harsh (Founder & Chairman – Mobiloitte Worldwide and Mobiloitte Foundations) also contributed as a keynote speaker for a session, he shared that “Mobiloitte has embraced Blockchain technology in its entirety. We are eager to collaborate with all like-minded businesses and people who understand the value of this trust-less, transparent technology to augment the positive provenance in archaic systems. We all should jointly adhere to the concept of common construction, joint governance and win-win development of Blockchain and work together to facilitate the bright future of Blockchain Technology”. Alliance Conference and Panel Discussion was attended by more than 200 guests and institutions from nearly 20 countries and regions around the world including relevant government department leaders, global blockchain technology experts, entrepreneur elites, global regional blockchain alliances, world famous scholars, and well-known venture capital firms. Mobiloitte in now having a strong presence in Blockchain Consulting, Implementation services market. Our new logo reflects and symbolises our current identity and mission. Blockchain offerings of Mobiloitte include, but are not limited to: Custom Blockchain development, Smart Contracts' Audit, Decentralised Apps, Coin Development, Integration and Mining, Crypto Wallets & Trade Exchanges development, ICO launch and allied tech, Marketing Support. We are updating all our collaterals, business cards etc with the new logo. It involves many people and processes to implement it globally and might take some time. We appreciate your kind support and patience. The Internet of Things (IoT) has become the next big thing in the technology world. But there are some big challenges to be overcome. Jagdish Harsh, founder and chief managing director of Mobiloitte, the an IT company based in New Delhi, Singapore, UK and USA focusing on BOTS, APPS, Digital and Internet of Things (IoT), discusses these challenges with Jagmeet Singh of OSFY and highlights the potential of the growing IoT space for Indian developers. Edited excerpts.How has IoT evolved in India? IoT has evolved significantly across the globe. You can find some great examples of this evolution in Singapore, Denmark and Spain. And this same pace of growth is catching on in India with the government’s clear focus on digitisation and the huge budget allocation around connected healthcare. A few focused companies are taking the initiative in this space, on their own. There is a large pool of well-trained medical professionals available in India, which has helped to enhance the potential of IoT developments in the healthcare sector. Also, the government has provided policy support to IoT enablers by reducing excise and custom duties, and offering exemptions in service tax. Having said that, manufacturers, entrepreneurs, software/hardware specialists and domain experts from all sectors need to collaborate and work hand-in-hand to set the right expectations. Apart from harnessing technology around IoT, empowering people in rural areas by making the solution platform affordable is likely to be the key to drive the growth of connected devices. The medical tourism market in India is reported to have had a turnover of around US$ 3.9 billion in 2016 and is predicted to hit US$ 8 billion by 2020. This is a major reason for manufacturers to develop new healthcare-focused IoT devices. Some new drug testing laboratories are also being established to advance medical services and help the government develop the country as a global healthcare hub in the near future. The worldwide IoT market value is predicted at over $220 billion by 2020. The Indian government has already constructed a policy to support this growing trend in the form of reduced excise and custom duty, and exemption in service in service. New Delhi, India – July 25, 2016 – Power Ministry of India continued to add momentum to Digital India campaign by releasing URJA India website, an effort to bring transparency for indian citizen to check ranking of their DISCOMS on laptop/ desktop computers. The website is accessible on www.urjaindia.co.in URL. URJA India website allows consumer to get various information about DISCOMS (distribution companies) in their local region as well as on national level. The platform is a great initiative by Integrated Power Development Scheme (IPDS) of Power Finance Corporation (PFC) to increase efficiency and productivity in power supply sector. Earlier in the month of June, the Power Ministry released URJA App for Android platform during the Conference of Power Ministers in Goa. URJA India website is an effort to make the data accessible through web browsers on laptops and desktops. The website is designed responsive, making it easy to use on smartphone and tablet browsers as well. With the release of URJA website, Indian citizen are now able to get power supply information, getting connected with the Ministry of Power under Digital India campaign. The two day Conference of State Power Ministers in Goa, on 16th-17th of June-2016, highlighted its objective of outlining ongoing schemes and issues related to power, coal & renewable energy sectors. During the conference, Honorable Power Minister Shri. Piyush Goyal released URJA App, developed by Mobiloitte, to bring transparency to citizens on performance of their DISCOMs and state and as compared to others. GOA, India – June 16, 2016 – The two day conference included Ministers and Secretaries of departments of Power, Renewable Energy, & Mines of all Indian states and Union Territories. The conference is aimed at addressing the implementation review of issues, improvements,and future plans related to power, coal, and renewable energy with digitization. The discussion included Ujwal Discom Assurance Yojana (UDAY), 24×7 Power for All, Rural Electrification Program, efforts required to reduce AT&C losses and other agenda. During the conference Shri. Piyush Goyal released URJA App to connect the citizens and DISCOMs of India with the Power Ministry. The app allows users to get information of performance of their town, DISCOMs and State level on different parameters including their ranking, pending consumer complaints, average power cuts, percentage of consumers making e-Payments, as well as power loss or theft. The app also gives information on schemes and initiatives that are being undertaken by the Govt. of India to improve the power supply. URJA App is built for the citizens of India and is currently available on Android mobile platform. Shortly it will be also available on iOS and Windows platforms. The app is designed & developed by the chosen technology partner, Mobiloitte – a leading full service Mobile App Company focused on BOTS, APPS, DIGITAL & IoT. Based out of New Delhi, Mobiloitte has veritable presence in Singapore, Dubai & USA with global delivery capabilities, attributed to its team of 500+ professionals across a wide gamut of technologies and platforms. Mobiloitte rated amongst the 25 Fastest Growing Enterprise Software Companies in India. Founded in 2004 as a Consulting & Staffing company with 10 people, Mobiloitte today employs around 400 people from 15 different states and speaking different languages, and is an authority in development of future-ready Mobile & Web Apps and delivery of next-gen Digital solutions. Headquartered at New Delhi and with representative offices/client proximity centers across Mumbai, Gurgaon, Noida (India), Auckland (New Zealand), & Massachusetts (USA), Mobiloitte enjoys global delivery capabilities and has a client base of 1500+ which includes names like Microsoft, GM, Goodyear, SanDisk, All India Radio, etc. By end of 2016 Mobiloitte is all set to double its team size, establish more offices within Indian and in Singapore & Dubai, and strengthen its solutions portfolio with services in the areas of IoT (Internet of Things) and SMAC (Social, Mobile, Analytics, Cloud). New Delhi – India, December 03, 2015: A Premier full service Enterprise Web and Mobile service provider, Mobiloitte has announced its readiness to enter the mobile game development segment. The company is expanding its web (Drupal, PHP, WordPress, ROR, Magento etc.) and mobile (iOS & Android via native and cross-platform approach) app development services to ”mobile gaming” segment. Mobiloitte is launching its 2D and 3D mobile game development services with great zeal and optimism. It has a team of eccentric and experienced game developers who have shown tremendous enthusiasm in unravelling company’s ambitions. The company has revealed that it is bestowed with innovative technologies like Unity3D, Cocos2Dx, Corona etc. and latest tools as vital to create 2D/3D Games. With right expertise, experience and programming, games will be aptly designed that will meet the screen resolution and technical specifications of user’s mobile platform. Cross platform 2D/ 3D computer graphics software/program Flexible plug-in architecture Effective designs with integrated development tools Open source or multiple source game framework Interesting modelling capabilities with animation & interactive applications Multi-player, single player and multi-level games Generate games for multiple platforms as per client’s specifications & requirements Game Development options @ Mobiloitte Mobiloitte has confidently expressed its determination to rule the heart of millions of mobile users by offering them world-class game development services in both 2D and 3D platforms. Idea of the company is to engross users by inputting interactive features, mind-boggling generic puzzles or interesting storyline in the mobile game software. New Delhi – India, May 10, 2015: Mobiloitte, a leading Enterprise Web and Mobile solutions company, today, announced that they will participate in the biggest event on mobile technology in Middle-East – The Mobile Show 2015, taking place on 12th- 13th of May at Dubai International Convention and Exhibition Centre. The event, which will throw light on various radicals of telecom, mobility, digitization and enterprise, allows attendees to participate in different informative sessions on innovative and cutting-edge telecom and mobility solutions from the best minds in the business. The event will also allow attendees to network with each other and explore business opportunities and learn how digitization will help them grow bigger and generate greater revenue. Mobiloitte, a premier, full-service provider for Mobile and Web Application development always encourages enterprises and start-ups to embrace emerging technologies. As a part of this journey it has now added IoT (Internet-of-Things) in its portfolio. 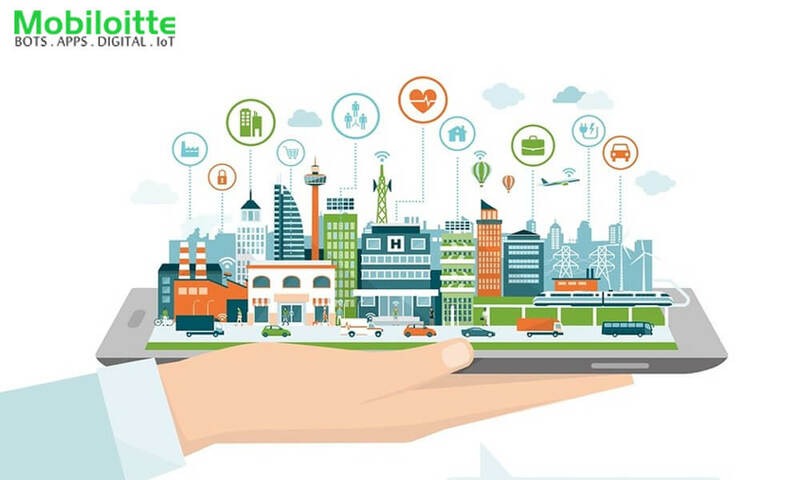 The company now intends to cater to a wide range of industry verticals covering Retails, Healthcare, Telecom, Manufacturing, Home Automation, Utility, Agriculture, Logistics, Biotechnology & Education, and helping them to reap the benefits from IoT. Today's world is a digital nervous system with sensors, connectivity, people and processes. The interactions between these entities are creating new types of smart applications and services. New technological trends, larger mobile adoption, low cost devices & sensors are combining to push the IoT market to the tipping point that's currently driving the market. Businesses are rapidly transforming themselves by using IoT and bringing greater value to their entire value chain. IoT along with AI, Blockchain & Data Analytics even bringing bigger impact.